The most hated vegetable on the planet. Brussels sprouts…they have to be one of the most hated vegetables on the planet (and yes there is an “s” at the end of Brussels, which is also capitalized, BTW). It ranks above broccoli, spinach, beets and lima beans as the most despised according to some polls I read. It’s not hard to see why. When prepared wrong, they can have a bitter, sulfur-y taste and a strong, unpleasant smell. To make matters worse, children are more sensitive to bitter flavors than adults. They often try them and the mindset that Brussels sprouts are “nasty” stick with them. They refuse to try them again and never realize that as their palates change, so might their view on these amazing vegetables. Yeah…I said amazing. I fell in to that same trap. Didn’t like them as a kid, figured I hated them as an adult. Mrs. G and I have been married for three years. In that time, she has made them once. ONCE…and I think I gagged on them. Granted they were frozen. This past weekend we went to Dallas Farmer’s Market. While we were there, she spotted some nice looking sprouts. Knowing that she likes sprouts, I acquiesced to her desires while quietly thinking to myself that I would have to suffer because of it. Little did I know how wonderful they could be when prepared right. Before we get on with the recipe, lets talk about the health benefits for a bit. Why should we eat this vegetable that is so hated? I won’t get all scientific on you. I’ll try and keep it simple. Brussels sprouts are loaded with fiber and protein and can be a low-calorie dish for starters. They also have potent anti-cancer properties and can boost DNA repair in cells. Still not convinced? They can help lower cholesterol, lower blood pressure, maintain low blood sugar, fight inflammation and aid in digestion. They are loaded with vitamins. One cup contains 20% of the Recommended Daily Allowance (RDA) of Vitamin A, 161% of Vitamin C and 273.5% of Vitamin K. Not to mention, they are loaded with folate and plenty of minerals like iron, copper and potassium. That’s just a few of the benefits of eating this little, miniature cabbage looking vegetable. If you need more, you can do some research of your own. For me? That’s plenty. How can it be bad when you start with bacon? Use the bacon grease to saute the onions. See? Getting better.! 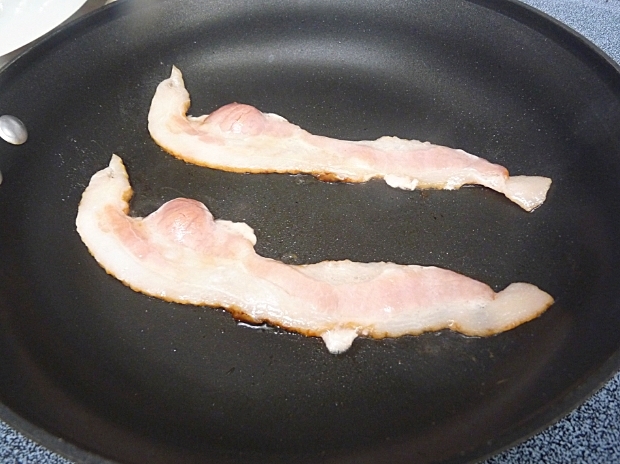 In a large skillet on medium high, fry up two pieces of bacon until brown and crisp. Remove and set aside. 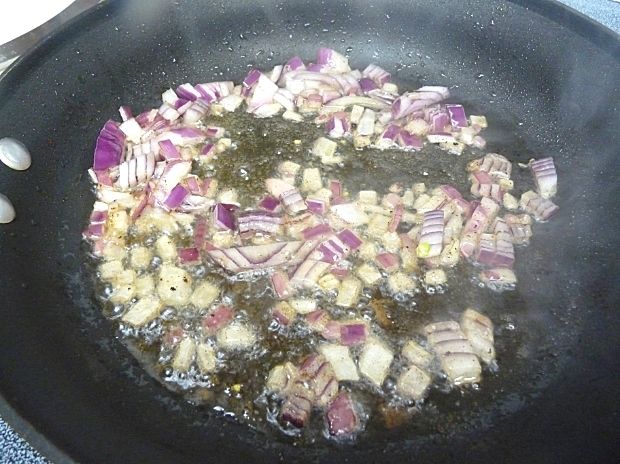 Add olive oil to the bacon grease and saute red onions until soft. 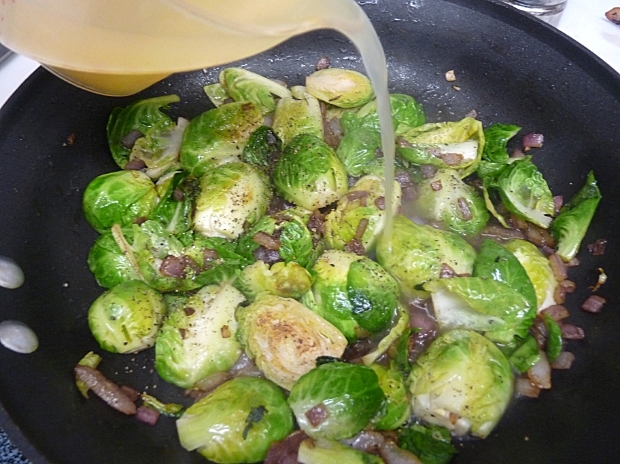 Add in Brussels sprouts and saute until bright green and slightly softened. Season with salt and pepper. Add chicken broth and bring to a boil. Turn heat down to medium low, cover and allow to cook for 10 minutes. Meanwhile, cut bacon into small pieces. 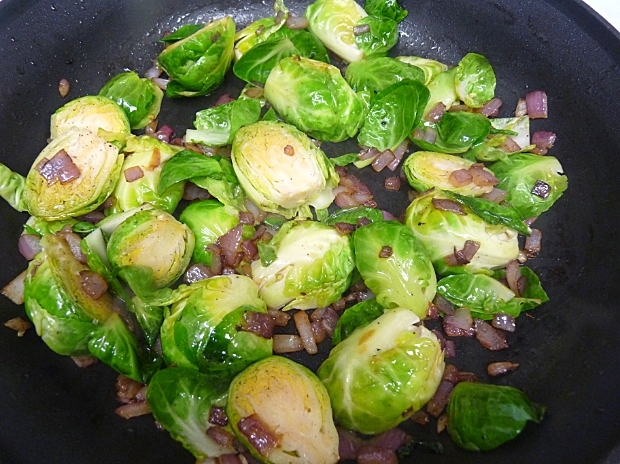 Add bacon to the sprouts after they have cooked for 10 minutes. Stir for 30 seconds and serve. Add chicken broth once sprouts have turned bright green and softened slightly. Add in the bacon after it has simmered for 10 minutes in chicken stock. How could it be bad seeing as how it has bacon it? Plated up with a chicken dish we are working on (we’ll get back to you on that one when we perfect it). Who knew I could like Brussels sprouts so much? Not my Mom, that’s for sure. She once had me sit at the table for hours and hours upon end till I finished everything on my plate. I out lasted her and she finally caved in. But not now! Not with these tasty sprouts. We actually ate them twice this week! I requested Mrs. G make them again and take pictures so we could do a post about them because I liked them that much! I ask you…Nay, I implore you…if you think you hate Brussels sprouts and haven’t tried them in years and years, give them one more chance. Try this recipe out and let me know what you think. I love Brussels sprouts! Unfortunately, Hubby can’t stand them (and yeah, I’ve forced him to try them so it’s not just the kid palate thing). I did note what you said though, and I think I’ll hold off on forcing them on Dudette. Maybe we can skip that whole step and just plop her in love mode when she’s older. Finally, I love your face lift. Very, very cool. Thanks. I get bored with the same thing and have to change it up every once in awhile. I’m probably on my 4th or 5th theme. The last one, I was shooting for a simple, clean look. This time I didn’t have anything in mind, but I saw this and it reminds me of how some restaurants write their daily specials on chalkboards. It just appealed to me. I just tried Brussels Sprouts your way, and I love them now! The sprouts I purchased from the 99cent store were large, so I worried if they might be bitter, but they were not! Thanks for showing me a new way to try this oh-so-beneficial hated veggie! Sent from my iPhone, please pardon brevity & spelling. I think I’ll pass on that one, Mickey. Isn’t it a little early for a beer? I really like the new blog. You stepped it up sir. Great photos as well. I lLove Brussels sprouts. I got a good recipe for you, but an easy way to cook them…olive oil, sea salt, pepper, and balsamic vinegar. Simple and easy, I like. I think I might try that and toss them on the grill to see how they turn out. Great post – they do have a horrible reputation! I’ll have to give this recipe a try, I have fixed kale similar to the recipe you have posted and it is great. I usually use a recipe for Brussels that has two versions (with or without cream) + bacon. My husband who hated them as a kid now loves them – as well as our four kids. I never thought I’d see the day when my children would be fighting over who gets the last Brussels sprouts in the dish! I’d love to hear more about your recipe with cream in it. Who knew kids would ever fight over them? Kale…I’ve only had it once and it was baked into a chip. Pretty tasty. Need to try it some more. You might have just inspired a new post. Thanks for the pointers, Matt. I’m gonna give those a shot. MMMM Love the sprouts. I planted 9 plants in my garden this year so I am hoping to be overwhelmed. I will be sure to make this dish. Also loving the new layout too. Very clean and easy to read. Thank you. I was looking around for something new, spotted it and just knew it should be the new one…until I get bored with it. I think this is now version 5 for my blog, maybe 6. I get bored easily. Are Brussels sprouts hard to grow? I am thinking of a change too. Not sure what yet though. No they are not hard to grow. Very similar to broccoli. They are a cool weather crop so they need to be planted early. When it gets hot they get bitter. So maybe I should wait till summer is over? I am not sure since I am not familiar with your weather. I am leaning toward yes though. I planted mine 2 wks ago, right after the last threat of a frost. Jason: Great post and a great new look for your blog. I’m the only one in my family that likes brussels sprouts, but this recipe may change their minds. Thank you for sharing. Thank you very much, Peter. I hope they like it. I’ve always loved Brussels sprouts (and all the other ‘hated’ veggies you listed) but Mr. Hungry Couple was a more typical hater when I met him. It’s taken me nearly six years to undo the damage of bad school cafeteria cooking. 🙂 Glad you found a way to love these little babies. Thanks. Its sad how poorly cooked food can shape our perception of them for the rest of our lives. Keep chipping away at Mr. Hungry Couple’s outlook on food. 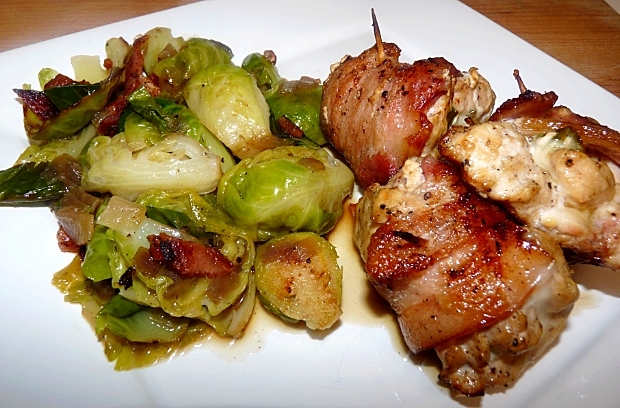 Always have brussels at Xmas with bacon and roast chesnuts – love them! I had no idea that Brussels were a Christmas tradition in some areas but the more I read about them, the more I see them. I’ll have to try them with chesnuts. 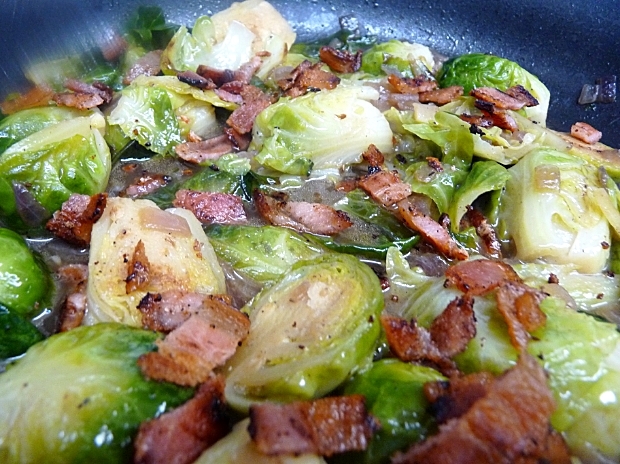 I have cooked sprouts on the BGE with bacon in a cast iron skillet- fantastic!! Then I par cooked some and cooked them on the BGE on skewers. Brushed w butter, good sea salt and lemon squeeze. AMAZING!!! Try it! Both methods sound wonderful, Tracy. Thanks for sharing them. I have finally accepted that I really don’t like Brussels sprouts. For the longest time I thought I just hadn’t had the right ones but last year I sat at a table with 8 other people who raved about the served Brussels sprouts and I still couldn’t stand them. Odd because I like other cruciferous vegetables like cabbage, etc. Seems like you are in the majority when it comes to those who hate them. They are not for everybody. Love the new layout and Sprouts on the Egg are awesome!!! I have done them similar to they you have a couple times in a cast iron skillet, direct. Gotta do these again soon I think!!! Thanks, Brian. Seems a lot of people like sprouts more than I thought and quite a few have cooked them on the Egg with or without CI. I’ll be trying that soon. Brussels spouts #1, Beets #2 most loved by this kid. Steam and canned, respectively. I’m having a love affair with this recipe!! I just made it again!! I even eat the leftovers cold from the fridge. Thanks again for the recipe. Thank you so much, Bev. I am glad you like them. You’ve got Mrs. G to thank for that one. We’ve made them four or five times since.